On lightly floured work surface, unroll dough sheet. With fingers or rolling pin, roll out dough to form 14x10-inch rectangle. With pastry or pizza cutter, cut dough sheet into 12 small rectangles. In small bowl, mix cream cheese, sugar and egg yolk until well blended. Spoon cheese mixture evenly on top of 6 of the rectangles. Top with chopped peach. Carefully top with remaining rectangles. With fork, press edges to seal. Place on ungreased cookie sheet. Bake 18 to 20 minutes or until golden brown. Cool slightly before serving or serve cold. Canned peach pie filling can be used instead of the fresh peach. You'll need about 1/2 cup filling. 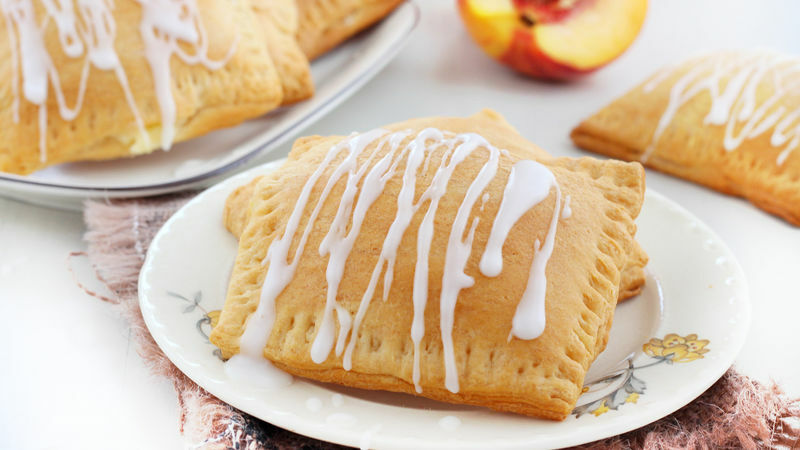 For an eye-catching look, mix powdered sugar with a few drops of water to form a paste and drizzle over the pockets.